If you're having some issues with your overhead door, or one of its parts suddenly breaks down on you, you can count on our professional repair specialists to come and help you out. We've been fixing garage door systems for a very long time, and there's no issue we can't handle. DIY can be a useful approach for all sorts of areas of your home. When it comes to your garage door, however, this is far from being true;the very opposite, in fact. Things like broken springs and frayed cables or a door that gets off track can be very dangerous, and trying to fix them without the right training and the professional skills and experience can lead to catastrophic results. When faced with any overhead door problem, it's always better to let our experts deal with things rather than exacerbating the situation and potentially injuring yourself in the process. Our team specializes in repairing everything from the exterior panels (whether their made of wood, aluminum or steel) to the interior tracks and rollers. The latter ones can dent or wear out, which willlead all sorts of problems, and may even cause the door to get stuck. No matter what the issue is, rest assured that our technicians have been doing this for a very long time, and we can take care of anything. The springs and the opener are two areas where prudency and a careful approach are absolutely required. The former are essentially the "muscles" of the system, and therefore are under a lot of stress. The latter is the motor that powers the entire mechanism, and requires a high level of technical skill and experience in order to be fixed. Opener repair and spring replacement are two of the different services that we perform with an additional focus on safety and efficiency. That's how we make sure that all our solutions and fixes related to these components are long lasting and effective. 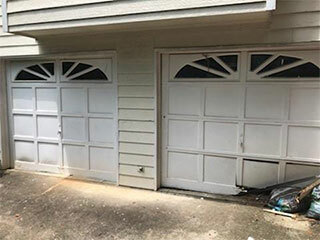 Reach out to our experts at Garage Door Repair Burleson today and let our professionals take care of all your problems. If it's an emergency service that you need or to schedule an appointment due to some strange noises and shaky movement, you can count on us to be available to help you.